Thirty-one Asian American youth died of drug overdoses during the sweltering summer of '71. A study of the Asian American community revealed the primary cause: Asian teens often felt alienated from the society around them. Differences in culture, family relations and lifestyle intensified a sense of being apart from society. A proposal to the federal government sought funding for the first ever drug abuse program for Asian Americans. The request was granted in 1972. 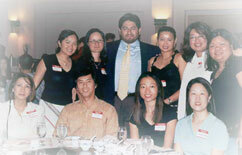 To this day AADAP remains the oldest and one of only two programs in America organized to provide services for Asian Americans with drug abuse problems. The problem identified thirty years ago persists today. A high percentage of Asian Americans see themselves as outsiders in a predominantly white society. Drugs and alcohol seem to offer escape from the struggles with the emotional stresses produced by ethnicity and culture. The AADAP addresses all factors contributing to drug abuse -- cultural, environmental and emotional -- using tools ranging from group counseling to acupuncture. One intensively regimented program leads to completion of the Drug Court Treatment Program leading to dismissal of all drug charges. Those in need of more intensive treatment are enrolled into AADAP's Therapeutic Community, a residential program lasting 12 to 18 months. It combines access to medical, dental and legal services with educational seminars high-school diploma courses and a wide range of social and recreational activities. Treatment is individualized to overcome specific obstacles to adjustment to life in the outside world. Recovered patients aren't abandoned to the streets. AADAP's Employment Access Unit takes them through a series of programs to enhance their employability. From occupational counseling to training in job skills, patients are prepared for success in the workforce. Being the most vulnerable to the temptations of drug and alcohol abuse, Asian American youth are the AADAP's major focus. In addition to presenting educational programs on drug and alcohol, the AADAP also educates Asian teens about the dangers of AIDS and involvement with gangs. They also provide fun events activities to give teens incentive to continue with the more serious programs. AADAP hosts a number of annual events for the Asian community like celebrations for Chinese Lunar New Year, Philippine Independence Day, and for the younger crowd, Halloween. AADAP programs are offered throughout Southern California, but the majority are in Los Angeles. For more info or to make donations, log onto http://aadapinc.org. Despite an enclosed courtyard and special security features, the APWC looks like an ordinary apartment building, not an institution or a dormitory. That's because the APWC's aim is to prepare its residents for life outside after an 18-month recovery period, considerably longer than the 12 months alotted abuse victims in other shelters. APWC uses the time to provide the psychological support needed to rebuild emotional stability. It also provides schooling, job skills training and job placement programs. Its approach has helped it achieved a 100% success rate in helping assisted women reach psychological and financial independence. APWC is a nonprofit organization dedicated to developing affordable housing for survivors of domestic violence. APWC is located in the Los Angeles area, but has taken in women and children from as far away as San Francisco and Texas to operate at maximal capacity. It welcomed its first residents in May of 2000. APWC is a multilingual center able to provide language-appropriate services for API women and children. For more info or to donate, log on to http://apwcla.org.